Catch a radiant sun setting into the Pacific during an Acapulco sunset cruise aboard the Aca Rey yacht. This catamaran will sail over Acapulco Bay while you dance to live music and drink from an open bar as the sky fades from blue to shades of purple, pink, orange and red. 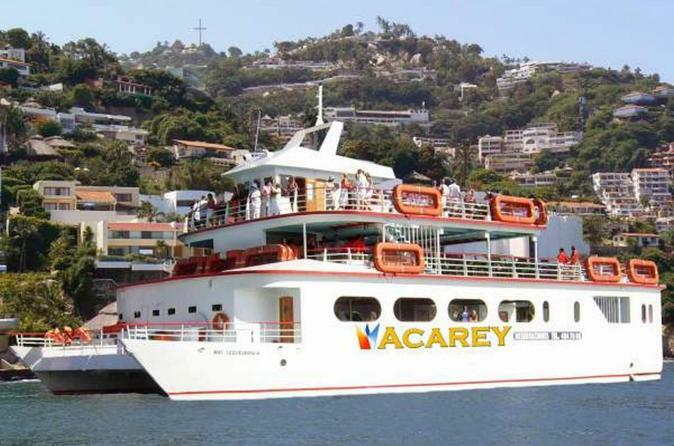 Enjoy a boat tour of Acapulco Bay, one of the most breathtaking bays in the world, on this Acarey Boat Ride Tour in Acapulco. We’ll admire the sunset, see some of the city’s impressive mansions and watch the amateur cliff divers at La Quebrada. This tour includes an open bar with high-end domestic drinks and music. Sail around the bay and enjoy an exciting party on the boat. Enjoy an open bar, salsa music, and dancing on board.